Incoming students at Lindsey Wilson College were told to mark their calendars for Saturday, May 9, 2020. That is when members of the Lindsey Wilson College Class of 2020 are scheduled to graduate from the liberal arts college. LWC President, William T. Luckey Jr., told the freshman class Saturday afternoon at an opening ceremony in the Roberta D. Cranmer Dining Center to make a habit of making good decisions throughout their next four years at LWC, and throughout life. College officials will not know for a couple weeks the size of this year’s freshman class. But each and every student was encouraged to treat the next four years as an Olympic event, to never stop “training” for graduation day. Luckey also encouraged the freshmen to take advantage of the opportunities they receive over the next four years — not unlike the way he did 35 years ago when he left home for college in the Midwest. LWC Student Government Association President Hannah McCandless of Elizabethtown, Ky., told the freshman to use this time to get out of their comfort zone. 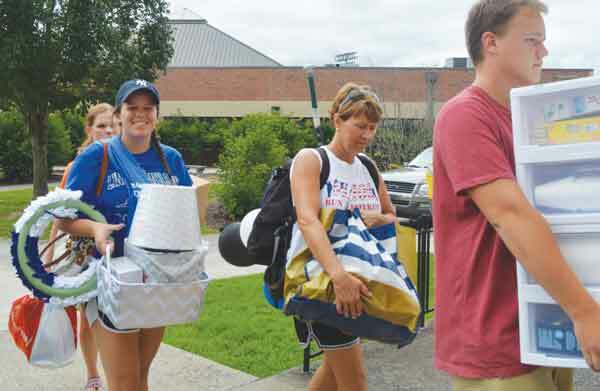 Students began moving into residence halls early Saturday morning — an annual tradition that longtime LWC Dean of Students Chris Schmidt said he always enjoys. Freshman Deaziah Lowe of Louisville, KY has been itching to get on campus for months, and says when she got here she was floored by the positive atmosphere. Lindsey Wilson College Class of 2020 assembles on the lawn of the campus quadrangle for the annual class picture. 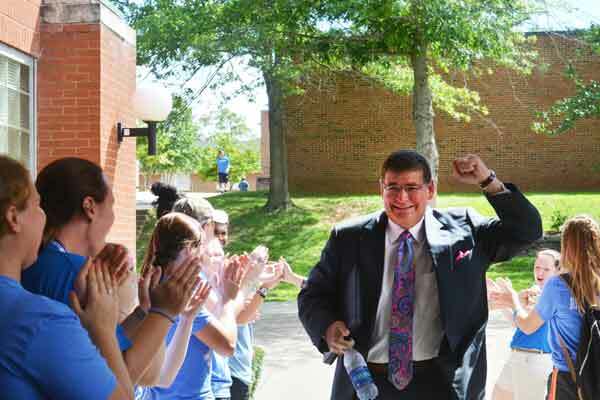 LWC President, William T. Luckey Jr., rushes into the Freshman Kick-Off ceremony in the Roberta D. Cranmer Dining Center. Returning students formed a “tunnel” outside the Dining Center to welcome new students to the ceremony. Freshman Mallory Cornish of Frankfort, Ky. is all smiles as her family moves her into Philips Hall on Saturday. Phillips Hall is one of the original three buildings that date to Lindsey Wilson’s founding in 1903. Today it is reserved for incoming freshmen students.